Developed by Ocean in 1986. Very similar to their C64 version, but has a proper palette, making it most arcade-perfect licensed port. Developed by Atarisoft in 1984. Developed by Coleco in 1982. Republished by Atari in 1988. Contains only the Ramp and Rivet Stages. Developed by Atari in 1988. Does not contain the Conveyor Belt Stage. Nearly all the sound effects are quite wrong. Contains title screen music very similar to the NES version. Developed by Atari in 1983. Republished in 1988 for the Atari XE Game System. Wait a few minutes, and the initials for one of the authors will appear. Donkey Kong was the actual pack-in game that was included with each ColecoVision sold — therefore it is very common, but the retail boxed version, presumably released for Coleco Adam owners, is very rare today. Pictures of the box can be found on the Jack Berg Sales website from the early 2000s when they were selling them. 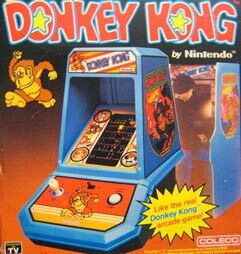 Also, possibly deserving its own listing is the Coleco Adam version of Donkey Kong, marketed as a Super Game. The game varied little from the ColecoVision cartridge version, with a few notable exceptions: 1) It was a high speed Digital Data Pack (proprietary tape format) 2) It added the Conveyor Belt Stage 3) It saved high scores. Novel retail packaging for the game was in the shape of a small arcade machine. This version provides up to four different skill levels, available by pressing the appropriate number on the keypad. When a stage is complete, it immediately switches to the next stage, which appears in a slightly different order than the arcade version. Once the third stage is completed, you will go through the following stages randomly. A bug in this version allows climbing ladders much more quickly: while climbing, quickly release the joystick and start climbing again. Mario will resume climbing at a much faster pace than normal. This is a very useful technique on longer ladders. Two different versions were developed. The American version was developed by Atarisoft in 1983. The European version was published by Ocean in 1986. The Ocean version is considered the more accurate of the two. Developed by Nintendo for the Famicom in 1983 and published for the NES in 1986. It was also made available for the Famicom Disk System as one of the first games purchasable through the Disk Writer system, where players could pay to write games to blank disks. In North America, Donkey Kong was later released on a compilation cart with Donkey Kong Jr., titled Donkey Kong Classics. None of these original versions contain the Conveyor Belt Stage. In the ladder stage, it is possible to grab the first ladder from the left side and proceed to climb down. This wraps the avatar to the top of the screen, bypassing most of the game. In 2010, Nintendo released a Super Mario Bros. 25th Anniversary red Wii console in Europe which comes preloaded with a special version of Donkey Kong for NES, dubbed "Original Edition". And it's quite a special version indeed: this version has had the conveyors stage reintroduced to the original game ROM, as well as some additional animation that was originally omitted. Donkey Kong now climbs off with Pauline at the end of a stage, for example. Note that this isn't simply a remake of the game made to look like an NES release - this is an actual NES ROM image that will presumably work on real NES hardware as well. A screenshot of the added conveyors stage can be seen below. Developed by Nintendo, first for the e-Reader in 2002, and later as a cartridge in the Famicom Mini/Classic NES series in 2004. Does not contain the Conveyor Belt Stage. Developed by Coleco in 1982. Contains only the Ramp and Rivet Stages. Developed by Atarisoft in 1983. Before Coleco launched the ColecoVision, they manufactured a series of table-top games based on several popular arcade games. These table-tops were designed to look exactly like miniaturized arcade machines that you could take home and play. Naturally, the gameplay wasn't spot on, but it was rather close — given the limitations of the technology. The Donkey Kong table-top featured one four-way joystick and a jump button. The player would initiate play by pressing the jump button. The game featured two screens, with identical ladder configurations for both screens. The first screen was intended to represent the ramp screen while the other represented the rivet screen. So the goal of the first screen was to climb up to the top while avoiding the barrels, and the goal of the second screen was to remove all of the rivets while avoiding the fireballs. It was particularly difficult to perform a running jump, and players were often killed when they intended to leap over the barrels. Other Coleco table-top games include: Galaxian, Pac-Man, Frogger, Ms. Pac-Man, Zaxxon, and Donkey Kong Jr. (which was directly licensed from and manufactured by Nintendo). 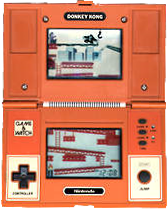 Before Nintendo designed the Famicom and the NES, they manufactured a series of handheld LCD games known as Game & Watch, some of which were based on their popular arcade licenses. Some Game & Watches are played on one screen, on devices roughly the size of thick credit cards. Others are played on multiple screens that were cased in a device that folded up, much like the Nintendo DS. 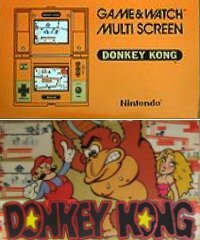 Donkey Kong was turned into a Multi-Screen Game & Watch. The bottom screen represented the ramp stage where Mario must jump over barrels. However, obstacles drawn over his head would prevent him from leaping, so jumps could only be performed in safe places. On the higher ramp, a beam moved overhead, creating an obstacle that you must avoid leaping into. 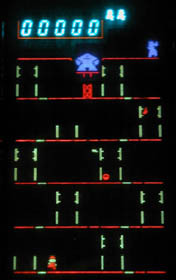 On the top screen, the player had to continue to dodge raining barrels that Donkey Kong tossed below, and flip the switch of a crane that would swing back and forth. The player had to jump and connect with the crane in order to be lifted up and remove one of the clamps keeping Kong's platform suspended. The player is then returned to the bottom of the screen for another round. Once all four clamps were removed, the player scores bonus points for making Donkey Kong fall, and the game starts over again at a higher speed. At 300 points, all lives that were lost are restored, and if no lives were lost, the game goes into double score mode until the first life is lost. Recreations of this version can be found on Game & Watch Gallery 2 for the Game Boy Color, Game & Watch Gallery 4 for the Game Boy Advance, and the Game & Watch Collection for the Nintendo DS. Two different homebrew versions of Donkey Kong have been developed, each striving to reproduce the arcade more faithfully than the original Coleco release for the system, and each doing so by different means. D.K. VCS is a version that seeks to keep the sprites as graphically close to the original arcade version as possible, and compensates for the difference in aspect ratio by introducing vertical scrolling. Due to the way that it renders different sprites at different times, it is difficult to capture screens which convey the game properly, so view the embedded video instead. The second homebrew, Donkey Kong Arcade, tries to get as close to the arcade game as possible, using the traditional television aspect ratio. The screenshots presented below come from this second version of the game. Donkey Kong XM is a version that seeks to update and improve upon the original version released by Atari. It is specifically designed to run on the "XM" expansion module for the Atari 7800, which improves the sound hardware of the system, which this version of Donkey Kong takes advantage of. Last but certainly not least, this version adds the Conveyor Belt Stage back into the game. Donkey Kong Arcade is a version of Donkey Kong programmed by Carl Mueller Jr which he began to develop in 2002. It contains all intermissions, and all 4 arcade levels, with the added bonus of being able to play as different characters - each with their own strengths and weaknesses. Each character has a different ability such as being able to jump with the hammer. Two noteworthy releases were provided to owners of the TRS-80 Color Computer. With the lack an official port of Donkey Kong, a clone was made in 1982 called Donkey King, developed by Chris Latham and published by Tom Mix Software. It played exactly like the original with minor graphical changes. Due to possible legal threats, the name was changed to "The King" in 1983. On March 31, 2007, John Kowalski released a new port of Donkey Kong to the TRS-80 Color Computer that was more faithful to the original arcade game than any port that has ever been made. Kowalski hand translated the original Z80 assembly language from the arcade to TRS-80 native 6809 assembly language, making it one of the most accurate conversions possible. It even supports all of the available dip switch configurations. A Color Computer 3 with 512KB RAM is required to make the game run. A 6309 allows the game run smoother, but is not required. This page was last edited on 15 June 2017, at 08:02.